COP24 (The 24th Conference of Parties) is the annual United Nations Climate Change Conference where world leaders, ministers, civil society organizations, youth, industry, and indigenous peoples gather to discuss the most pressing issue of the 21st century: Climate change. 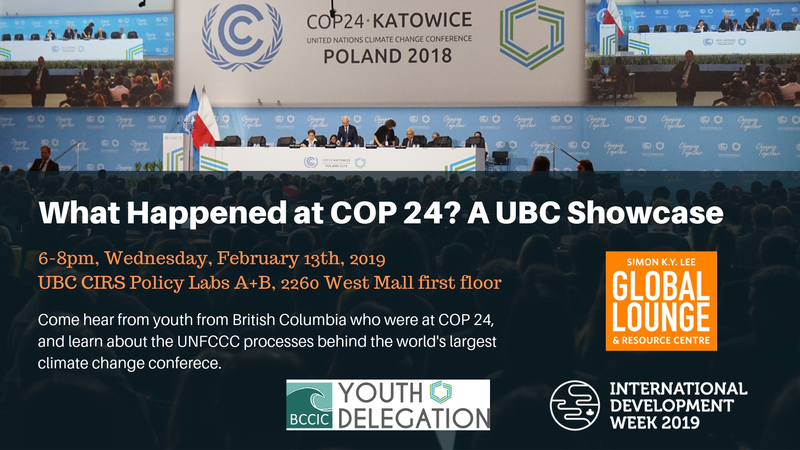 Several UBC alumni and students had the pleasure of attending COP24 as part of the British Columbia Council for International Cooperation (BCCIC) Youth Delegation. We are eager to share our experiences, learnings, setbacks, and hopes for the future with anyone interested in the UBC community and beyond. + In order to keep this event as waste free as possible, please bring your own Tupperware container and mug for food + drink. + We would like acknowledge that this event is held on the traditional, ancestral, and unceded territory of the Musqueam people.